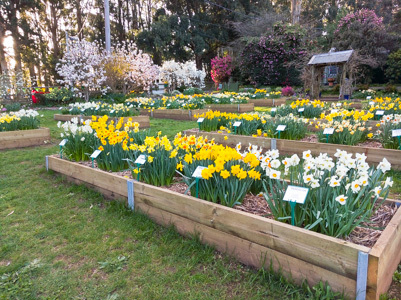 and discover how to make your own Magical Spring Garden with daffodils and spring flowering bulbs. You are invited to visit our farm while the daffodils are in bloom from Friday 24th August until Sunday 30th September 2018. Take this unique opportunity to select and order your favourite varieties for planting next autumn by choosing from the flowers themselves. You will enjoy colourful and extensive indoor and garden displays, plus a huge variety of fresh cut flowers, potted daffodils and collectors bulbs. Complementary tea & coffee. Picnic ground opposite. Bus tours are welcome (please book on 9754 3328).